Provides cutting-edge advanced audio technologies, truly lifelike musicality and the best wireless multiroom audio solution in the industry. “This new line of premium AV receivers provides the ease and accessibility for control of multi-zone audio installations that custom integrators will applaud," said Bob Goedken, Yamaha. Yamaha today elevated the state of the art in audio and video entertainment design with the introduction of the premium AVENTAGE RX-A 60 Series network AV receivers, offering the ultimate in immersive ultra high-definition home theater entertainment and wireless multiroom audio capabilities. Born from the Yamaha legacy of tonal quality and craftsmanship with musical instruments, the premium AVENTAGE series of network AV receivers is built from the ground up with the latest advances in acoustical science and engineering design. These AV receivers are crafted with the highest-quality components that are obsessively matched and engineered using short signal path runs, painstakingly grounded circuit boards and secure anchoring by a sturdy frame-and-beam chassis design, all to provide the ultimate sonic excellence. 4K Ultra HD video and HDMI ports capable of high dynamic range (HDR) pass through are included in all six AVENTAGE RX-A 60 Series models. This ensures the ability to see pictures with eight-times higher resolution than 1080p full HD and the widest possible contrast ratio, ranging from nearly perfect black to more than 1,000 nits of peak brightness. The result is breathtakingly pristine 4K Ultra HD video supporting: 3840 x 2160p resolution; up to 60 Hz high frame rates; coverage of the BT.2020 wide color gamut; 10 / 12-bit color; 4:4:4 chroma subsampling and HDCP 2.2 copy protection. For skin-chilling home theater sound, Yamaha leads the industry by placing DSP processors throughout the AVENTAGE RX-A 60 Series line enabling out-of-the-box support for a wide assortment of surround sound formats including the latest Dolby Atmos and DTS:X object-based sound formats. These formats provide immersive theatrical experiences with over-head height channels that will have the audience ducking from roaring dragons flying overhead. Like the growing family of Yamaha wireless speakers, sound bars and Hi-Fi gear, AVENTAGE RX-A 60 Series AV receivers include the ability to play and distribute the exclusive MusicCast wireless multiroom audio system that has turned ears since its arrival last fall. MusicCast offers more flexibility than other wireless multiroom audio solutions with built-in Wi-Fi and Bluetooth® for added connectivity to music services and to smartphones or tablets to easily stream music through the AV receiver. Additionally, all models support high-resolution audio music files including: ALAC at 96 kHz / 24 bit, WAV, AIFF, FLAC up to 192 kHz / 24 bit, DSD to 5.6 MHz. Vinyl music aficionados will find that AVENTAGE AV receivers, starting with the RX-A760 through the RX-A3060, have a phono input with preamp support for turntables with cartridges. With MusicCast, these AV receivers can even send music from a turntable wirelessly to MusicCast-enabled products in other rooms in the house. The MusicCast app ties it all together with simple-to-use operation using iOS or Android smart devices. All AVENTAGE RX-A 60 Series AV receivers include the proprietary YPAO™ sound optimization system, which has garnered growing acclaim for its ability to automatically analyze speaker placements, then tune and calibrate sound levels to the dynamics of the specific listening environment. AVENTAGE AV receivers ensure the sound experience is tailored to the unique conditions of each home. Subwoofer equalization (EQ) is supported in all AVENTAGE RX-A 60 Series models and the RX-A760 model on up benefit from subwoofer parametric EQ down to 15.6 Hz. Further, the Yamaha Compressed Music Enhancer is now optimized for Bluetooth® audio transmission to ensure wirelessly delivered music remains clean, crisp and complete with a full range of sound. For those who have long coveted a network AV receiver with the technical sophistication and craftsmanship in the AVENTAGE series and are looking to step into the series, Yamaha has created the RX-A660 as a high-performing, base-level model this year. Featuring 7.2-channel surround, the network AV receiver includes four HDMI inputs and one output with HDCP 2.2 copy protection supporting 4K Ultra HD video resolution with HDR and BT.2020; Dolby Atmos and DTS:X object-based surround sound speaker setups of 5.1.2 channels; built-in Wi-Fi and Bluetooth® wireless connectivity and YPAO™ sound optimization. The AV receiver outputs 80 W per channel and includes Extra Bass to enrich sound even with small speakers and high-resolution audio playback. The AVENTAGE RX-A760 features 7.2 channels with Dolby Atmos and DTS:X set up to 5.1.2 channels or can output 5.1 channels plus Zone 2 with auto switching. The AV receiver steps up to 90 W per channel; six HDMI inputs (three with HDCP 2.2); one HDMI/HDCP 2.2 output and includes: phono input; Rhapsody and SiriusXM Internet Radio; YPAO™ with Reflected Sound Control (R.S.C.) and intelligent assignable amps. The AVENTAGE RX-A860 is a 7.2-channel network AV receiver that enables Dolby Atmos and DTS:X setups of 5.1.2 channels or a 5.1 channel plus Zone 2 with auto switching. The AV receiver steps up to 100 W per channel; eight HDMI inputs (three with HDCP 2.2) and dual HDMI/HDCP 2.2 outputs. The receiver includes: YPAO™ R.S.C. with multipoint measurement and a vanity door front panel. Also included are intelligent assignable amplifiers with the user’s choice of surround back or front presence channels. The AVENTAGE RX-A1060 features 7.2 channels and enables a Dolby Atmos and DTS:X setup of 5.1.2 channels or can output 5.1 channels plus Zone 2 with auto switching. The AV receiver steps up to 110 W per channel; eight HDMI inputs (seven with HDCP 2.2) and dual HDMI/HDCP 2.2 outputs. The AV receiver also features: symmetrical amp layout; advanced dual ESS SABRE DACs for quieter and more fluid sound and YPAO™ R.S.C. with multipoint measurement with a 7.1-channel equalizer. Other features include: advanced HDMI zone switching that allows all sources to be output via HDMI to a second zone and Zone 2 features including Zone Volume EQ, Zone Extra Bass and Zone Enhancer. The AVENTAGE RX-A2060 boasts 9.2 channels in a network AV receiver that enables Dolby Atmos and DTS:X speaker setups of 5.1.4 or 7.1.2 channels. 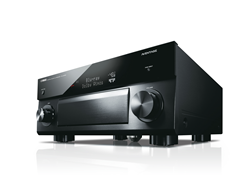 The AV receiver steps up to 140 W per channel and includes dual ESS SABRE DACs and YPAO™ R.S.C. with 3D, multipoint and angle measurement and 9.2-channel equalizer. The flagship AVENTAGE RX-A3060 features 11-channel processing in a network AV receiver and enables Dolby Atmos and DTS:X setups of 5.1.4 channels, 7.1.2 channels or 7.1.4 channels (with an external 2-channel amplifier). The AV receiver steps up to 150 W per channel; ESS SABRE 32-bit DAC with the ability to fine-tune ultra-low jitter phase lock loop (PLL) mode to exactly the desired level; and YPAO™ R.S.C. with 3D, multipoint, 11.2-channel precision equalizer and 64-bit resolution.